Did you hear that noise from the heavens today? Today was Bible study day, and I spent part of the time in a classroom, as I have the past several weeks. One of the teachers moved to Arizona, and I’m filling in for her. I worked on the word search alongside the kids for awhile, but I was also chatting and helping the other teachers, so I didn’t get to finish mine. 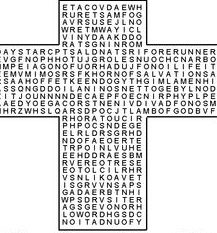 But I like a good word search, so I tucked it in my bag to bring it home and finish later. So this evening I worked on finishing it. For a ridiculously long time. I mean, to be fair, it’s a good sized puzzle, ’cause some of these kids really need to be challenged. But still. I searched and searched, but I simply couldn’t find one last word. Even though I have a pathetically painstaking approach to word searches. Bordering on compulsive obsessive. Row by row, concentrating on each letter, looking for the key letter in my target word. I was getting ready to hand the puzzle to my girl and let her give it a go, when I tried it one more time, choosing a different key letter. Then I found it. Finally. And while I was busy being absurdly proud of myself for finding it, it occurred to me what that word was that I’d been searching for for so long. If you heard God giggle today… that was at me. There are some great words in there — shepherd, servant, carpenter, forerunner, salvation — but I still haven’t found perseverance!